This review is of a Corsair Strafe RGB keyboard with Cherry MX Blue switches provided by Corsair for review purposes. CPU’s, GPU’s, RAM and motherboards… All key components many of us fret over when upgrading our machines or when putting together a new rig. However often left out or relegated to mere afterthoughts are the peripherals; keyboards, mice and other bits of kit that get used constantly. Great peripherals are in many ways just as important as good internals. They are the main devices that we use to interact with our computers and often get overlooked during purchases, with people settling for whatever is lying about such as a spare, cheap HP keyboard or those Apple chiclet abominations. A good keyboard to me is as vital as a high end CPU or graphics card and over the years I’ve had the opportunity to use many. I’m personally a fan of mechanical keyboards, rather than the standard membrane based offerings you usually receive if you buy a PC from a retailer in a box. I personally find the travel and definitive click when pressing the keys of a mechanical based unit far more pleasing to use. This obsession of mine stretches all the way back to the amazing SIIG Suntouch 101 keyboard I had in the 90’s. When I first discovered this beauty, I loved it. These days my daily driver is also a Corsair, but a K70 (also using Cherry Blue switches) non-RGB. I’ve had it for a little over a year and it’s been a solid and gorgeous clicky keyboard. My wife and kids get annoyed by me clacking away on it at full whack but that’s their problem, not mine! Today we’re spending some time with a mechanical keyboard, featuring Cherry MX Blues. The Corsair Strafe RGB. 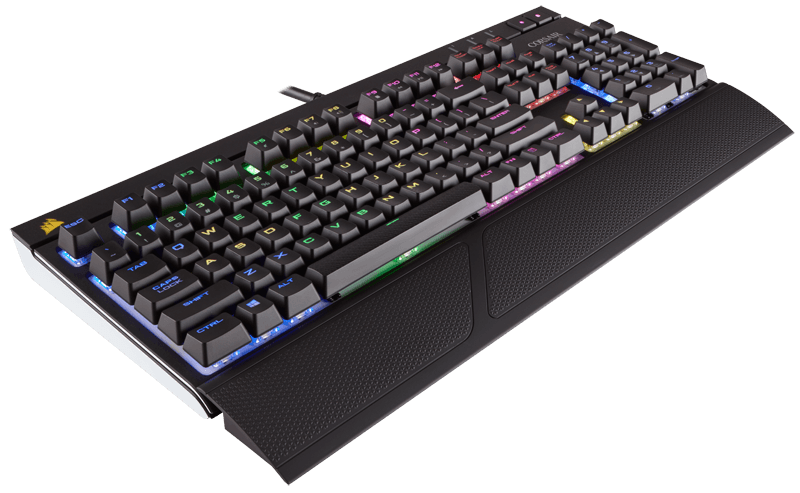 Corsair have recently released a “Stealth” version of this keyboard, still with mechanical switches but with the silent, non-clicky kind. Well, I can’t stand those switches, but thought I’d take a look at the Strafe since you can choose which type of switches you get on it.